We often talk about 'the media' as this single industry where everyone is doing the same thing. This was something that made sense in the past, back when the role that you had as a journalist was not that different whether you were a newspaper reporter, a magazine journalist or a TV presenter. But the digital world has changed all this, and with it also how we define journalism and the media. Today we have multiple media industries that each work in very different ways and that require different roles and models. In this article, we are going to discuss why this is, and also how we must change the way we categorize 'the media'. Everyone is talking about Facebook and for a very good reason. After their announcement last week that it would focus even more on 'friends and family', publishers have been in a frenzy to figure out what this means and what to do about. Fundamentally, my reaction to that Facebook is changing again is: 'meh' ... because a persistent trend for the past 5 years has been that publishers shouldn't count on Facebook to fix their future. What happened last week is just another small part of this trend. Facebook is really good for low-intent snacking of random things, and this has provided publishers with a lot of accidental traffic. But every trend points towards that this isn't a profitable long-term publishing model, regardless of how much traffic you get (or now don't get). But more to the point, the market that Facebook is in is very good for Facebook, but is it really what you want as publishers? I talk about all of this in this article, where I go through the way I look at Facebook's latest change. Here is a tip that has dramatically improved the value that I get out of the many newsletters that I subscribe to. As you already know, newsletters are the 'new internet' for publishers, and we are seeing very strong growth across the board. Just one of many examples is Condé Nast's 'New Yorker' that is now getting 12% of its traffic from its newsletters. And this traffic isn't just random people, but high-intent valuable readers who have chosen to connect with them. But, if you are a person like me, you are probably getting far too many newsletters and, looking through them each morning is futile, because so many of them aren't about something you need at that moment. So, what I have done to manage my newsletter is that same that I used to do with my RSS readers (read this article over at Forbes), which is to categorize my newsletters based on what need that they provide. The way this works is that I have set up a specific filter for each and every newsletter I subscribe to, and then when it arrives it is automatically moved out of my inbox and into a number of highly specific folders. The 'Excellent' category is my special folder for those few newsletters that I absolutely need to see. 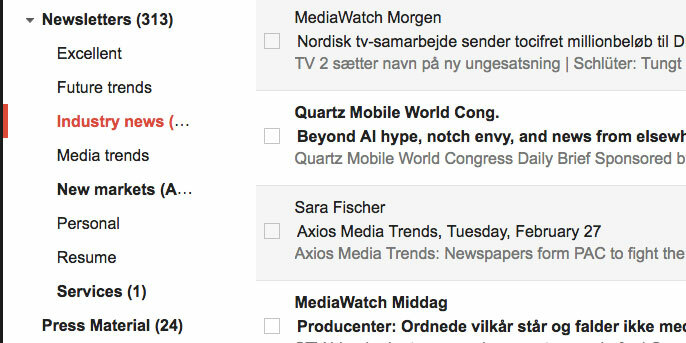 The 'Future trends', 'Industry news' and 'media trends' are all newsletters that I subscribe to that I need for my work. 'New markets' is a relatively new thing I am spending more and more time with (specifically Africa), because there are some really interesting things going on in that market. 'Resume', is where all the newsletters from the Swedish business magazine 'Resumé' is going into, which I write a monthly column for. Finally, we have 'services'. These are those from the services that I use (for my business), for instance, newsletters from my web host, from MailChimp, etc. And, everything else that doesn't fit into these categories is then just added to the general 'newsletter' folder. I used to do with my RSS feeds and it was brilliant, because it means I can focus on what type of information that I want to read about, without having to look through all of them. This saves me time, it helps me focus, and it makes newsletters much more valuable. I fully encourage you to do this, because as newsletters become more and more important, finding a good way to manage them is going to be essential. So, create your own categories, and then set up a filter for each newsletter you subscribe to. I'm doing this not just for my newsletters, but for every email I get, and I have now built up 478 filters that automatically takes a specific source of email/newsletter, removes it from my inbox, and instead place them in the correct folder. It's a simple tip, but it's very much worth doing.